If you want to generate your prospective students from Linked in especially for continuing education courses, you can now automatically add leads to Salesforce from LinkedIn Lead Gen advertisements. 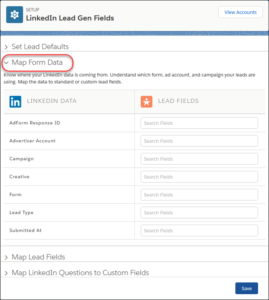 When prospective customers fill out a form on your LinkedIn ad, we convert the data directly to new Salesforce leads. This feature is new in both Lightning Experience and Salesforce Classic. Assign the new leads to the user or queue you choose. You can add up to 500 leads from LinkedIn per day. If the number of leads you get in a day exceeds the limit, we email the additional leads to the default lead creator you designate in Setup. Marketers can choose the new standard report type. The Report Builder creates reports showing each campaign with its opportunities and their value. If you are not using opportunities, you should be leveraging them to measure campaign ROI. This can be easily done with automation. Reach out to me for a sample automation script to create opportunities automatically. When your advisor select Chatter notification emails in their inbox, Lightning for Gmail now shows the profile information for the user who made the post in Chatter. It also includes the record the comment was posted on. Lightning for Gmail is also smarter about matching email addresses to records in Salesforce, and no longer asks advisors to create a user representing the Chatter email address (reply@chatter.salesforce.com). These changes apply to both Lightning Experience and Salesforce Classic. Reps can maintain their momentum while writing and working with emails by pinning Lightning for Outlook open. There’s no need to open the feature over and over again to access customer data. The pin option is now available in Outlook 2016 on Windows that is installed using Click-to-Run with build 7900 or higher, with no additional setup required. This change applies to both Lightning Experience and Salesforce Classic. Searching for emails in Salesforce is now possible. You can now search your student emails quickly on the global search. You can now use groups, group memberships, topics, and topic assignments with workflow rules and Process Builder. Send automatic emails to a group owner when a member leaves. Or automatically add a specific topic to a post. This feature is available for use anywhere you use processes and workflow rules. For example, you want to keep close tabs on the topic #AwesomeAdmin in your Org. You create a process in which you get an email every time someone assigns the topic to a post. That way you are pinged whenever someone is happy with your admin’s work. Assign skills to your agents, and route work items to them based on their skill sets with skills-based routing (beta). You can use skills-based routing instead of queues as a more flexible way of routing cases and work items. Skills-based routing uses the Service Resource, Skill, and Pending Service Routing objects and is set up through the API. Contact Salesforce to enable skills-based routing for Omni-Channel. This change applies to both Lightning Experience and Salesforce Classic. Use rules to define how new cases originating on social media are assigned and routed to agents. Rule-based routing eliminates manually routing cases or using custom Apex. And in addition, it takes just a checkbox in Setup. 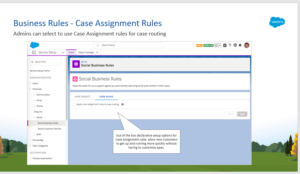 Create case assignment rules using clicks, not code, to quickly resolve cases. This change applies to Salesforce Classic and Lightning Experience. You can now assign most audience criteria to individual components on a page, making it that much easier to get the right content in front of the right members. Pre-build consumer journeys with Marketing Cloud and deploy them to your partner networks; including franchise owners, financial advisors, and insurance agents. Partners using Sales Cloud, Service Cloud, or Community Cloud can then easily manage and personalize these consumer journeys. This can work for higher ed institutions who use third-party lead generation services like international partners to get prospective students. You can create prospective student journeys which can be leveraged by these partners to provide the same experience to the students. To summarize, I would say here are the top 3 features which higher ed institutions should leverage from Spring 18. Outlook and Gmail feature in spring 18. Please feel free to post your comments below for any questions. If you have any specific question on a topic, feel free to email me at buyan@eigenx.com.